Everything changed for the better when we started using slack at work. We’ve made countless custom integrations; doorbells, intercoms, travel cards, reddit, lunch menues, git hooks, server monitoring, you name it – we haz it. My family has been using Google Calendar for a few years. Me and my wife used to think that we we’re busy every night and that there was no room for improvisation. Google Calendar showed us that we had lots of free evenings and weekends, which has been great. When it was time to evaluate a group chat app, I saw no reason to use HipChat, Skype or anything like that. Slack to the rescue! Slack’s free tier gives us 10 integrations, search for the latest 10 000 messages and 5GB storage. This is plenty for a family of 4. In this blog post I’ll go through how we use it and the integrations we have made to aid us. We use channels just the same way we use them at work. “fixahuset” is a channel for stuff that needs to be fixed around the house, “general” is important stuff, “handla” is for picking up milk on the way home, “mathem” is an integration i’ll get to in a bit, and “random” is the usual cat gif mayhem we’ve all learned to love/hate. “pedertest” is where i test new integrations. Integration no 1: Where are the kids? We, as most parents to 10yo kids, ask this question daily. Picking them up at school, but they’re at a friend’s house, etc. Gah. This is a custom Slackbot command, which calls out to my server and returns the result. 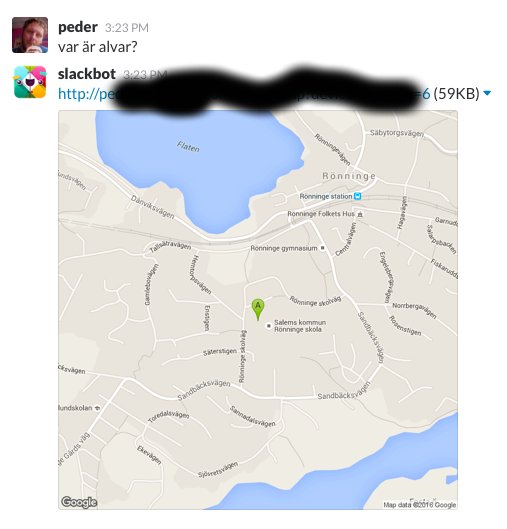 My server runs a little curl script that calls out to Find My iPhone and returns a static GoogleMap image. The kids will probably start to question this thingie eventually, but works for now. Our old Google Calendar integrates very smoothly, just hook it up and let Slack know when you want the notifications. In Sweden, MatHem is one of the biggest e-commerce sites for groceries. We use them for a weekly delivery, and it works great. The night before delivery we generally take 10 minutes and cram everything we can come up with into our cart, which means that we miss a lot of essentials. What if we could add uhm… juice to our cart throughout the week, the moment when someone realise that we’re out of uhm… juice (“sök” means search, “köp” means buy). This integration is not kosher at all, and I’m probably breaking some terms and conditions. But we need this, and it could be done, so hey. If you work at MatHem or is offended by this in any way – please let me know and I’ll cease and desist. That’s all the stuff we’ve got now, but more to come. Applying tactics from work to family life may seem cold, but I see this as a way to make the most out of our time. It’s not like we’re writing Jira stories or planning our vacation in Trello. Yet. Lots of people wrote and talked about this, like Qz.com, Forbes, NyTeknik (Swedish) and Apparat (Russian). And on Twitter (1) (2) (3) (4), Hackernews and Fatherly.com. CBC Spark also made an interview, which was great fun. Great practical tips for family oriented Slack use… I’ve been trying to come up with something more concrete to support the feeling I get that Slack would be useful for my family, so this is really helpful. Love the integration for adding stuff to your weekly grocery shop, that’s inspired me to try something similar over here in the UK. very cool. We are working on a new integration for Slack designed to improve engagement and health through team challenges and rewords. Thought about how this could work for families i.e. get family members to challenge each other to do things and reward, but were not sure how to approach it. We are still in development, but should have beta up and running early March. Would love to have your family on the beta. Let me know if interested. Just curious, why Slack and specifically not HipChat (I understand why not Skype)? They seem really similar. I have used both and don’t see why I would choose one over the other, but have not gone deep into either. Great post! Would you be able to post the find my friends curl request? Very interesting article. I was unaware apple had an api for find my iPhone. Mind providing a little more information? Schools in Sweden have RSS feeds for the student’s events? You’re not just living in the future, you’re living in a utopic future. Could you please provide an example of the find my iphone script? What is this “little curl script that calls out to Find My iPhone”, I’d love something like this. Hi there, you may want to consider a to-do list for your family Slack chat. http://www.zlapps.com/todo Let me know what you think! I’m loving it! But do you actually get the others involved too? I would imagine that is the hard thing. Mathem-integrationen, är det något du kan dela? Har du skrivit ett eget program eller så? Great idéas, if you use public transport you could also integrate with with SL for example. Have you seen https://www.trafiklab.se/? what library did you use for find my iphone? Would you mind posting the curl/script you are using with Find my iPhone? Verkligen imponerade, speciellt integrationen med Mathem. I like and feel using a plug-in like Kyber (https://kyber.me/slack-integration-with-calendar-and-reminders/) can add even more functionality usefulness to shopping lists, and school events! I love to take my productivity tools from work back home to (at least try to) organize my family. I’m a programmer at work. I have had more luck using “single use apps”, like OurGroceries to create shopping lists, Trello for making to-do-lists and Google Keep for notes of any kind, Facebook Messenger for chatting and Sunrise as calendar. I haven’t tried Slack at home, but my experience is that when I try to use tools that can do “everything”, it always ends up being too complicated. 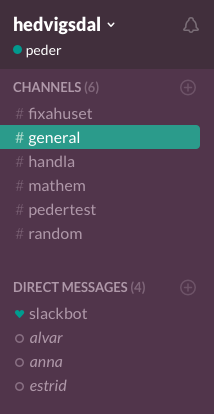 What is your experience with using Slack for so many different tasks? Does the rest of your family use it for keeping track of fixahuset, for example? And does anyone but you buy stuff from MatHem through Slack? yup, would be very easy to hook up. great idea! would love to help out. i’ll email you. Mathem grejen verkar helt fantastisk, jag hajar bara inte hur jag ska få det att funka på Slack? I love the location tracker thing, but I think it will be less comfortable for the kids if you track them day and night. We also use slack in our company and our favorite integration is with Google Calendar. We can set up meetings, get notifications, etc. via slack with that.